Easy To Install. Strong. Long Lasting. 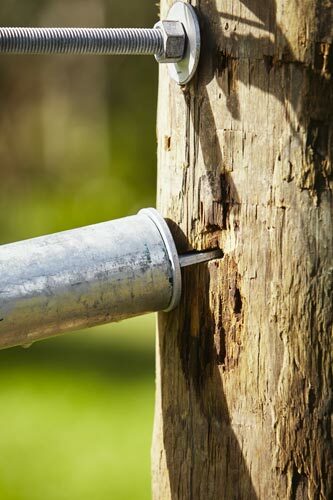 Looking to replace or install a new stay for your timber post? Our timber and pine post fitting kit makes putting together a new end assembly a breeze. Are you looking to fix up an existing end assembly, or want something that lasts? Our fitting kits are simple and can take 5 minutes to install. The design of our Twist Tight Stay Connectors means you can run your end assemble at any angle. Our unique design incorporates a cable instead of a tension rod. 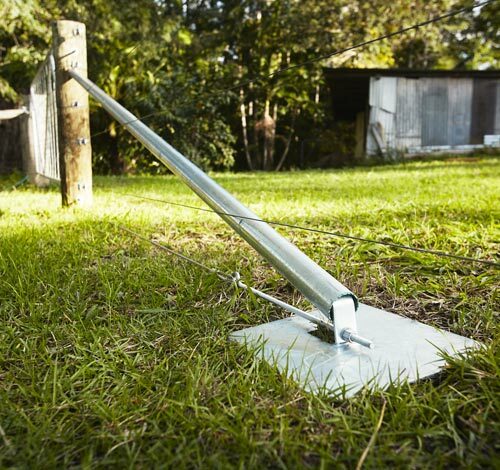 It is a lot quicker to install - just drop the loop over your post, or slip knot it if you have existing wire installed and run the tension cable to your footplate. No drilling required. All components are either stainless steel or hot dipped galvanised to ensure​ a long lasting end assembly. Be careful of other alternatives that say they are galvanised (when really, they aren't). Know the difference here. What's Included IN Your Pine fitting kit? 5 Twist Tight Stay Connectors: These are made from hot dipped galvanised steel. 5 Footplates: These footplates are made from hot dipped galvanised steel, which means it will last longer than other alternatives. The tongue on the metal plate that goes into your stay is welded on. As a result this footplate is more durable, more secure and stronger than other footplates on the market. 5 Tension Assemblies: This includes a cable made from stainless steel and a hot dipped galvanised steel eye bolt. The cable is already connected to the eye bolt and the loop is already set up. 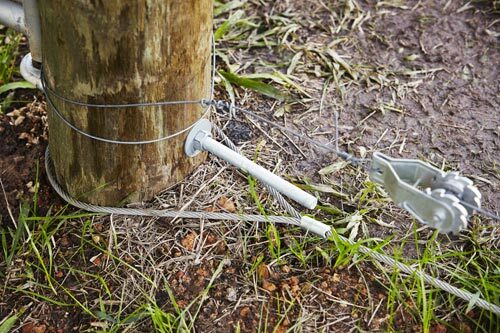 The loop is slightly larger than our standard cable loops to make sure it fits around most timber posts. No need for rope grips, saving you time. 1 Red Box: Everything is stored in a compact box for easy storage and portability. Just grab the box, chuck it on the back of your ute and you're ready to go! WHAT'S INCLUDED: Foot Plates, U Tension Cables, Twist Tight Stay Connectors (without clamp). In this video we walk you through how to install a Pine Post Stay Kit, which includes the fitting kit and stay.